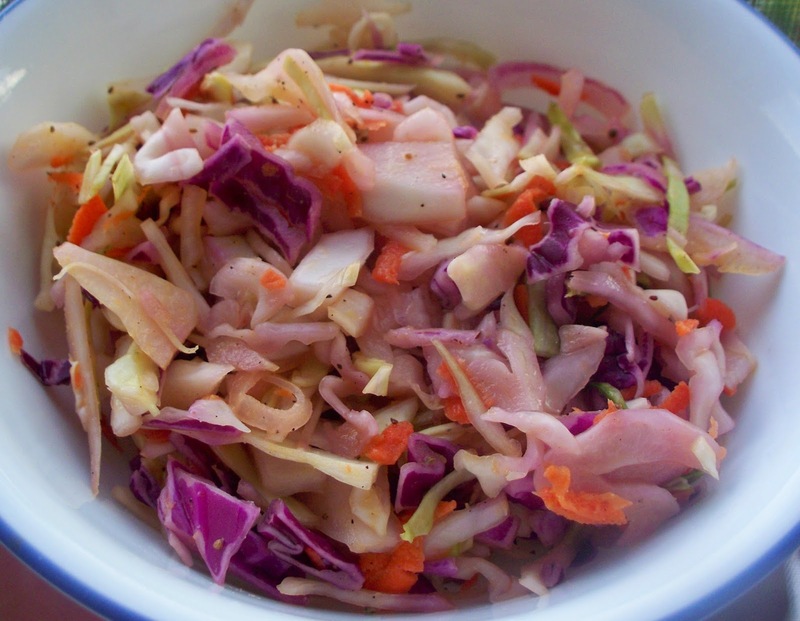 This recipe made a delicious coleslaw. The problem is that it made way to much delicious coleslaw... and I only made a 1/2 batch. The recipe stated 8 servings, and we got over 16 from the half batch. That being said, here is the recipe I made (and you may want to 1/2 that if you don't eat a lot of coleslaw). Note: our local grocery store doesn't display 1/2 or 1/4 heads of cabbage, but they will cut one for you if you ask. You should ask at your own if you don't want to end up with extra cabbage and nothing to do with it. The worst they can say is no. Jess didn't care for the onion as much as I did, so if you are not an onion person, you may want to skip this. Combine the cabbages, carrot, and onion in a very large bowl. Combine the sugar and vinegar in a small saucepan and cook over medium heat, stirring continuously until the sugar dissolves. The very next step is to let it cool so make sure to cook it as little as possible. Let cool and then whisk in the remaining ingredients. Pour mayo mixture over the cabbage mixture and toss to coat. Or put a cover on the large bowl and give it a very good shake. Busy Bag of the Month: Ice Cream + Numbers = FUN!